forestry | Sommerberg Hotel Bad Wildbad, Herzlich Willkommen im Panoramahotel über dem Enztal! 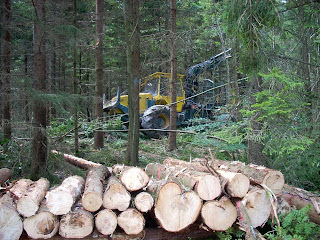 The ‘Waldfresser’ (forest-gobbler) is a rare beast but its noisy hydraulics and high-powered saws soon reveal its location. This monster can fell a tree, strip it of its branches and cut it into equal sized logs in just a few minutes. 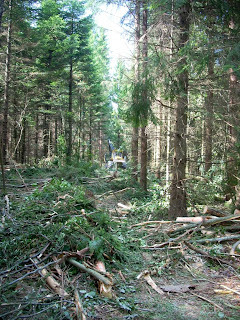 The ‘Waldfresser’ leaves a swathe of felled trees in its wake creating what seems to be a new track through the forest.